On to the main event, dessert! Okay, so for the last few months I have been working out at a CrossFit gym near my house. Three times a week, my alarm goes off at 5:30am so that I can get a beat down from my trainer Jesse. To say that I really enjoy my workouts would be an understatement. Seriously, I LOVE this kind of exercise and am really looking forward to the day that I can do 1 pull-up (oh and I will get there, I assure you!). Anyway, during my training sessions I am always telling Jesse about what yummy confection I just made or will be making soon. Not exactly the most germane topic of conversation in the gym, but whatever. So when I heard his wife's birthday was coming up I couldn't help but volunteer to make her favorite dessert. It's best to make this cake one day in advance or the night before. Pour the strawberries into a bowl and cover with warm water. Let sit for about 10 minutes. Drain and sprinkle sugar over the top of the strawberries and set aside. When the berries are totally thawed, mash with a fork or potato masher. You could do this with fresh strawberries too - about 2 cups. Preheat the oven to 350F. 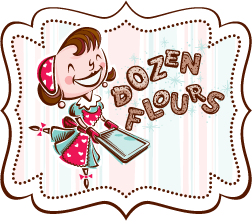 Butter two 9x2" round cake pans and dust with flour (or use Pam with Flour to prepare the pans). Line the bottoms of the pans with parchment paper. Put pans on a baking sheet. Set aside. Sift together the flour, salt, baking powder, and baking soda into a small bowl and set aside. Beat butter on medium speed until very pale and creamy (about a minute). Add sugar and beat for another 3 minutes. Add the eggs one by one, and then the yolk, beating for 1 minute after each addition. Beat in the vanilla; don't be concerned if the mixture looks curdled. Reduce the mixer speed to low and add the dry ingredients alternately with the buttermilk, adding the dry ingredients in 3 additions and the milk in 2 (begin and end with the dry ingredients); scape down the bowl as needed and mix only until the ingredients disappear into the batter. Divide the batter evenly between two pans and smooth the tops with a rubber spatula. Bring half and half to simmer in heavy medium saucepan. While it is simmering, in a separate heat proof bowl, whisk the sugar, eggs, egg yolk, and flour together until well mixed. Take the milk off the heat and very slowly, gradually whisk in the hot half and half - start with just a quarter cup and take your time adding it to the egg mixture. If you go too fast, the half and half will curdle the egg mixture so it's important to temper it slowly. Once you get about 1 cup of half and half in the egg mixture, you can slowly add the rest; it's just the first cup that you need to take your time with. Once all the half and half is transferred, pour the mixture back into the saucepan and whisk over medium heat without stopping until the mixture thickens and comes to a boil, about 4-5 minutes. Boil for 1 minute. Pour into medium bowl. Stir in vanilla. Press plastic onto surface of pastry cream. Cover and chill until cold, about 4 hours. (Can be made 1 day ahead. Keep cold). Makes 2 cups. The next day, when you're ready to assemble the cake, about 5 minutes before you're ready to make the cream, put the cream, whisk attachment or beaters, and bowl (metal if you're using a hand mixture), into the freezer to chill. Pour the cream into the cold bowl and on the whisk the cream on the highest setting (if you're using a stand mixer, have a kitchen towel ready to drape over the stand because this will spatter.) After about 2 or 3 minutes, as the cream is starting to keep its shape, add the vanilla and the sugar. Continue mixing until it's good and firm, but still soft. If you over mix it, just add a little more cream and it will soften again. Remove the strawberries and custard from the refrigerator. Transfer the strawberries to a sieve to drain as much of the juice as possible and mash the stawberries again really well. Whisk the custard vigorously to loosen it up. Starting with the first layer of cake and using a pastry brush, paint some of the strawberry juice lightly on the surface of the cake. Then, with a long metal icing spatula, spread enough custard (about 1/2 cup) over the cake and layer to cover it completely. Repeat this step with the next two layers of cake. 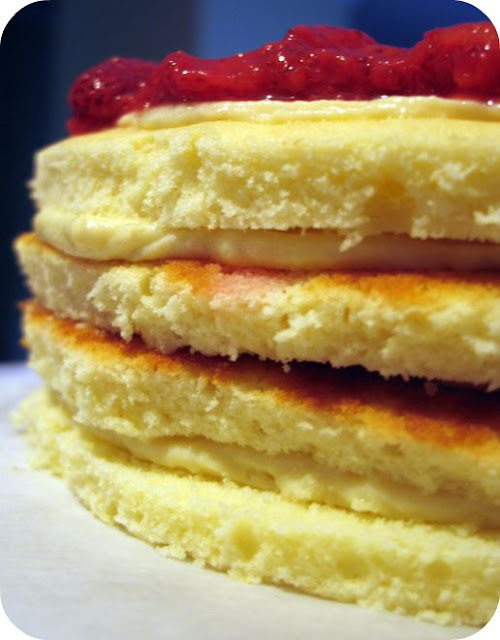 On the last layer, don't brush it with the strawberry juice. 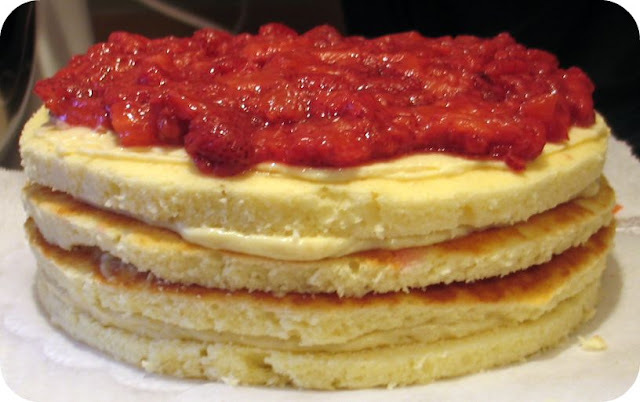 Instead, just skim a very thin layer of custard over the top, and then top with the mashed strawberries. 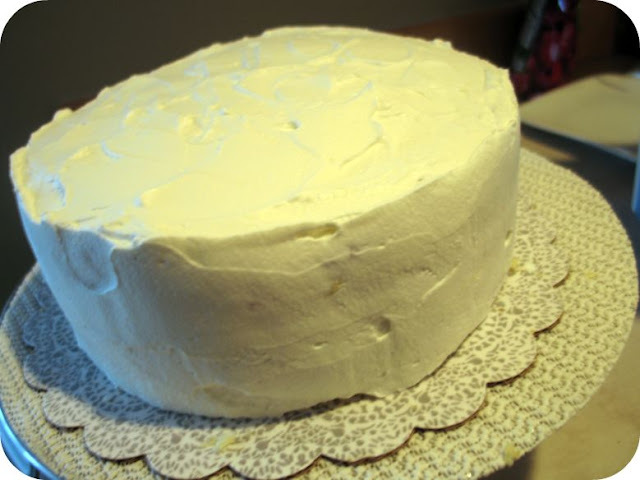 Top off the cake with a generous layer of whipped cream on the top and sides. Refrigerate for at least 3 hours or even overnight. Decorate with fresh strawberries or with fresh mint, or just leave plain like I did. Anyone who could look at that cake and then taste it's yumminess and not drop to their knees in thankfulness needs me to kick 'em one good time! I checked out your before and after photos. Both are VERY nice. Your new colors deffinitely make the room look warmer. I can not believe you did that grid by hand. WOW! No way would I even have attempted it. So what's the mural gonna be? Are you doing it again yourself? Sorry but I'm no help in the interior design dept. Good luck! I repeat your cake came out awesome!!! Julia, Hi! I've left you a little chocolaty something on my blog. Pls, stop by to pick it up! how beautiful! this looks delicious! i love the "strawberry goo" and the custard also looks great. the color contrast between the goo and custard is beauitful!! Totally tasty!! In the end it's all about portion control anyway ;) Thanks a ton! Oh yum! Looks like a very sweet treat!